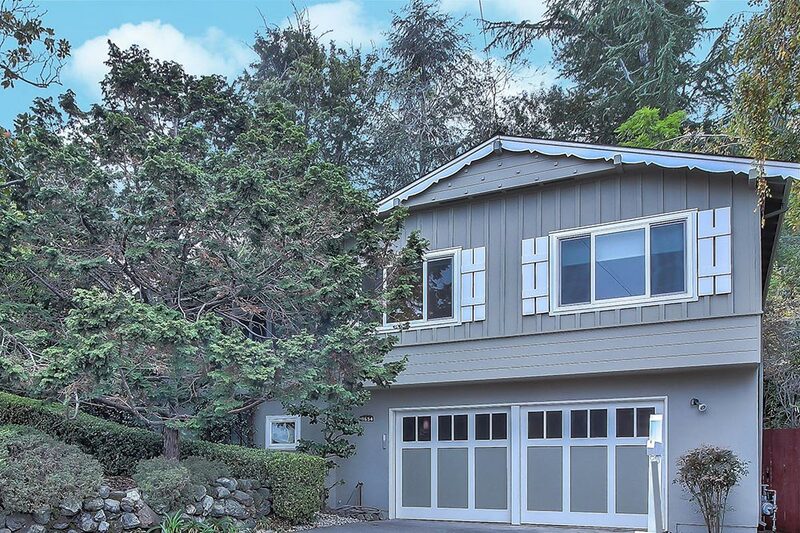 This grand scale Farm Hill Estates family compound nestled in the hills of Redwood City sits on a large 7910 +/- sq. ft. lot. A well kept wood and stucco pale olive exterior with white trim welcomes visitors to this split level ranch home. Lovely front yard mature landscaping creates a peaceful zen feeling. Following the formal entry is an oversized living room/dining room with gleaming hardwood floors and fireplace. Sliding glass doors from the dining room access the weather-protected rear deck. The all new gourmet kitchen is a paradigm of style and convenience; granite counters, shaker cabinets, stainless steel appliances and pantry. This living level is completed by a huge master bedroom with closets galore, a lovely rear yard view and adjoining bath. Two adjacent bedrooms share a hall bath. A completely finished newly carpeted lower level can dual as an in-law unit due to its tremendous size for extended family. A large family room plus 4 bonus rooms could be study and sleeping rooms including full bath, separate entrance, laundry room and access to 2 car garage. Sliding glass doors from family room access large rear patio and backyard with new fencing and Chinese Elm, Blue Spruce, Jacaranda and Fir trees.